Today I want to share with you a card I made for a friend. 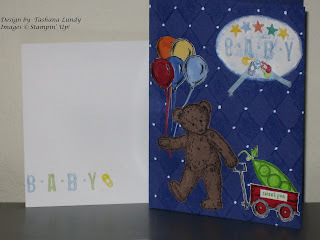 As you can see, it is a baby boy card. Sorry. All the items used in this project are retired. I just thought it was super cute and I had to share it. Still working on getting some videos for you all. I am also going to share some projects made with new stamp sets on Monday. So keep buzzzing by.